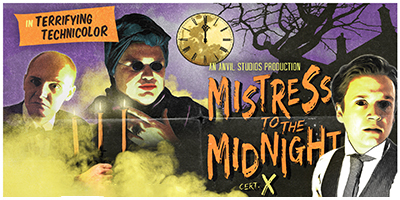 One from the vaults... Come witness a spoof of the classic British horror film live on stage. A respectable young lawyer is invited to a foreign land, drawn to a house of promises unkept and bodies disinterred. The clocks are ticking, the woman is waiting and the baby's been crying in the cellar for decades. Uncovered after years from the wreck of the infamous Anvil Studios, this long lost motion picture is brought to life for the first time in fifty years. An evening guaranteed to be thrilling, chilling and funny as hell. Written and performed by Jack Robertson, Chazz Redhead and Jacob Lovick.